Focus is extremely important, not just for startups but also for cities that want to attract startups. The Hague stands out for having made a clear choice to focus on cyber security. 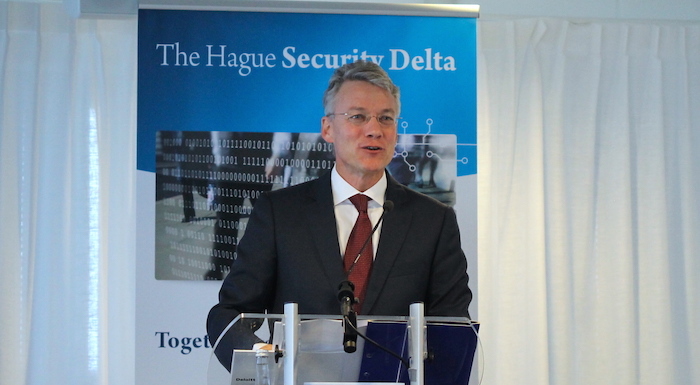 With their The Hague Cyber Security Delta they have been successful in connecting companies, education and government to help make the world more secure. There is a huge talent shortage, offering opportunities for universities and also for students to learn relevant skills. Finally there is a lot of educational work to do to help future generations use the Internet safely. We need to educate and engage all students and also children. All in all, the message was surprisingly upbeat. The Cyber Security Week is not about warnings and risks, but rather about opportunities and actions. Cybersecurity is not a problem, but a condition for economic growth. By getting cyber security right, The Netherlands can become/stay the Digital Gateway of Europe. The opening itself was not focused on startups (startups are welcome, but Cyber Security Week is not a startup event). Giving companies acces to capital is one of the goals for The Hague Security Delta. They are partners with StartupDelta and their company memberships are also open to startups (Zerocopter is for instance a member). X-systems X-systems provides security for mobile devices. Next to this track, a second track exists for fintech startups. The selected startups for this track are: Declaree, Gyomo, Limitless and POM. While pitching for capital is nice, the real value of The HSD and also of the Cyber Security Week lies in actual business. Companies need better security, and startups can provide this if larger companies are willing to do business with smaller companies. Within the HSD, people realize that real collaboration is needed. Inge Philips emphasized the economic impact of cybercrime, including the recent malware attacks. The Netherlands has not been targeted yet, but is sustaining collateral damage and should get more prepared. Also small and medium sized companies need more security. Jos Nijhuis, CEO from Schiphol, explained in a panel discussion that security of their whole supply chain is important. They need all business partners, including small suppliers, to have adequate security. Luckily there are new standards in development such as Security Verified that make security certification more practical for startups like these. For startups this is good news. Smaller companies should be easier to approach for startups than larger corporates. Let’s hope all the networking in the cyber security week pays off and The Netherlands stays a safe place to do business. For the development of a healthy startup ecosystem, it is good to see that startups are included in non-startup events. Themed events such as these have an important function in connecting startups with customers instead of just investors and other startups. We are looking forward to more HSD initiatives. If you would like to visit the rest of the Cyber Security Week, the program can be found here.